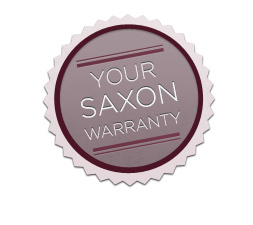 saxon warrants that during the Warranty Period, your saxon product will, with normal use and service, be free of defects in materials and workmanship. saxon does not have any liability for any products that have not been purchased from an authorised dealer or is determined to be stolen goods. Your warranty does not cover products that have been subject to abuse, misuse, improper handling, physical damage, improper repairs and/or modifications. Product malfunction or deterioration due to normal wear and tear is not covered under this warranty. This warranty is effective 1 January 2012 and supersedes all other warranties noted in brochures, instruction manuals, product packaging, etc. Provide us with proof of purchase and the defective product upon request. saxon will use all reasonable efforts to repair or replace any product covered by this warranty within 45 calendar days of receipt. This warranty extends to repaired or replaced Products for the balance of the applicable period of the original warranty or ninety (90) days from the date of shipment of a repaired or replaced Product, whichever is longer. This warranty is applicable only to Products sold as new.